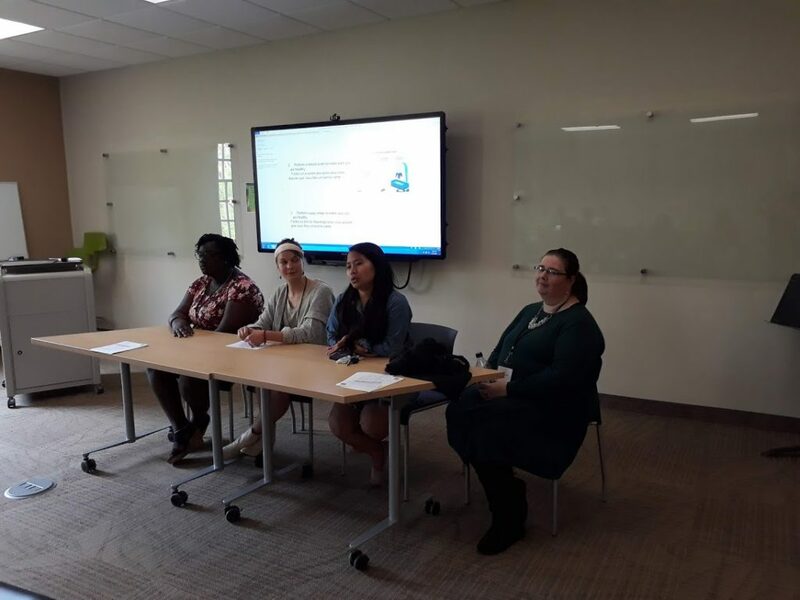 This past Wednesday, April 17th at the Guilford Undergraduate Symposium, four students in PPS 250: Every Campus a Refuge II presented on their class projects. The goal of the project was to create something helpful for the refugee families hosted at Guilford College and the organization as a whole. Sophomore Ree Ree Wei (who is minoring in ECAR) presented on her short documentary. She stressed that she wanted to create a platform for actual refugees to share their stories in their own voices. Her documentary was of an interview with a refugee from Myanmar. One of the key points the interviewee discussed was the struggle that comes with lack of citizenship and documentation in refugee camps. This very issue did not allow him to attend college. Wei stressed that the three month period that refugees are expected to get acclimated to a new culture should be at least a year long. She talked about language barriers and the physical and mental health needs that require more time to be addressed. Wei expressed that she would like this to be an ongoing project where she or other volunteers interview multiple families and potentially come back years later to see how things have changed. The stories may be posted on the ECAR website in a series of documentaries. 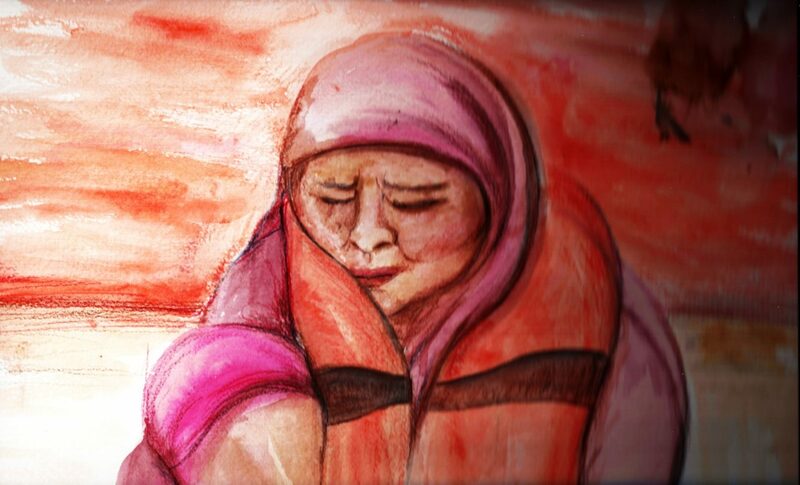 She argued that all refugee stories deserve to be heard. Angela Morrow, who is minoring in ECAR, presented on her fundraising efforts. She reached out to many local businesses and raised awareness about refugee resettlement needs along the way. She reported that many did not know about the refugee crisis and did not realize that refugees give more to their communities than their communities give to them. Along with vendors she had recruited, Angela tabled at Lake Fest, an event at Guilford College’s Serendipity. Vendors sold jewelry, lemonade, sunglasses, and more. She has plans to fundraise with Knickerbockers, a photography fundraising company that specializes in old fashioned portraits. The fundraiser should take place in May. She also will be having a Krispy Kreme fundraiser during finals week for hungry and studious students. Senior Robin Bigaj and freshman Bree Diakite worked together to create an information booklet for pregnant people to be paired with a “toolkit” and left at the ECAR house (the house on Guilford’s campus where our guests live when they first arrive in the United States). Bigaj and Diakite conducted interviews with ECAR guests that have been pregnant and/or given birth since their arrival in the U.S. The interviewees highlighted challenges with miscommunication from language barriers and a lack of cultural sensitivity from healthcare providers. The booklet has resources and instructions on what to expect from the U.S. healthcare system. Diakite translated the booklet into French and is working on getting it translated into Arabic and Swahili in order to accommodate hosted guests. The toolkit will have diapers, baby food, sanitary napkins and more. Each student took their passions and skills and created projects that will help ECAR and its guests for years to come. Conference attendees discuss ideas between presentations. 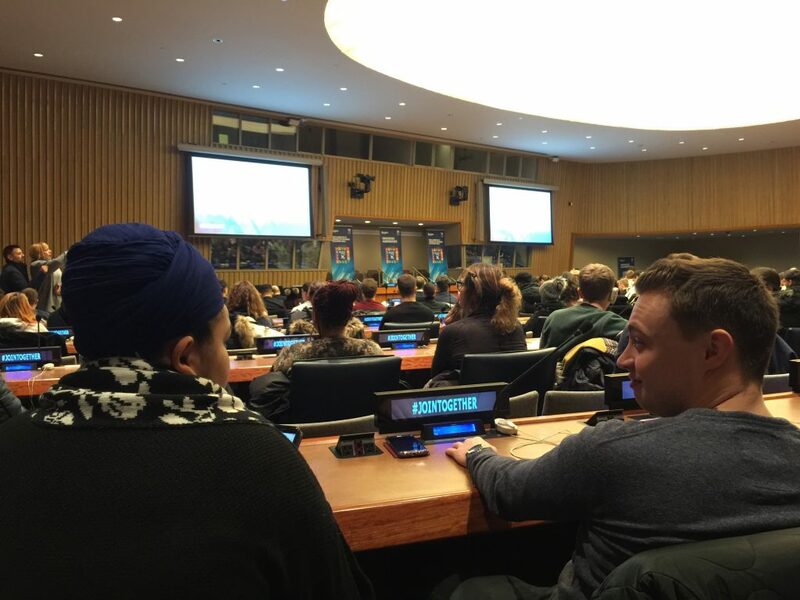 On Monday, January 7, a group of Guilford College students and faculty represented ECAR at the United Nations Headquarters in New York City. 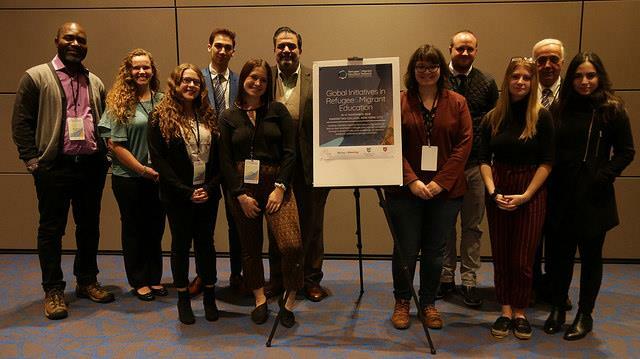 The conference consisted of dozens of organizations, speakers, and panelists all working towards a common goal: creating initiatives, apps, and programs to help refugees and other underrepresented people find success. “The guiding foundation of the conference was to bring together these hundred partner universities and colleges to talk about what they were doing around the world to support refugees in their communities,” said Guilford Teaching Specialist and Program Coordinator Dr. Sonalini Sapra. Guilford College student Angela Morrow (who is minoring in ECAR) asked the very first question of the conference. “I had heard young people here at the conference, as well as back at our school, talk about how they as individuals can’t make a difference,” Angela stated. How would the speakers challenge these individuals and help them realize they can make a difference as well as point them towards some solutions, she asked. The panelists pointed out that they themselves were able to make a difference, and that individuals can use similar methods as the speakers or even start simply by volunteering locally. Angela Morrow asking the first question at the conference. 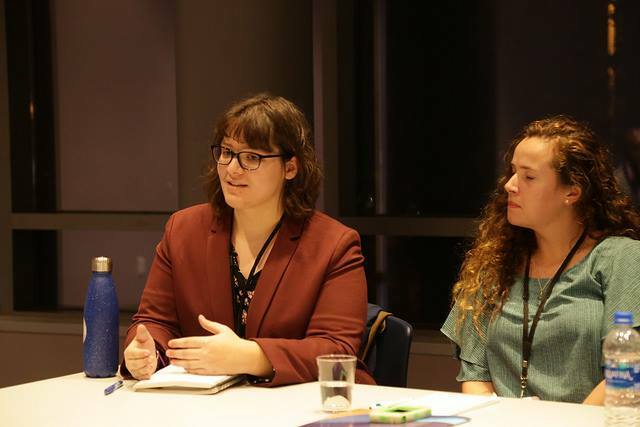 Guilford Senior Caitlyn Councilman thought the conference was “inspirational” and helped “broaden [her] ideas of the world.” It was a diverse line-up that tackled all kinds of issues from sustainable food to education. “Being able to connect with so many like-minded people that were all working towards a similar goal was very valuable,” Councilman said. Junior Brenna Carpenter, among other members of the group, shared similar feelings of inspiration and empowerment. There is, in fact, room in the movement for all kinds of people — leaders and followers alike. “[I gained] a greater sense of my own power. We all have our limitations, the awkwardness we feel when out of our comfort zone or area of expertise. The truth is, yes the world needs experts and masters, but we also need humble volunteers and a critical mass of people willing to show up and learn. The world feels smaller and I feel larger,” Carpenter said. While the conference had a plethora of presentations and speakers, some presentations really stood out to the group. Sophomore Ree Ree Wei (who is minoring in ECAR) found that a university in Rome was making a big impact. “One organization I found very valuable was an institution in Rome that helps refugees get college degrees so that they can reintegrate into society. They can even take classes in their own language,” Wei said. Senior Casey Graziosi (who is also minoring in ECAR) enjoyed a presentation on the importance of farmers in China. “I really liked this presentation by a woman going to school in Beijing who talked about problems people face in rural communities where people are abandoning those areas to go to cities. Farming is decreasing more and more because they are not getting paid as well and are not considered as valuable. Her project was about working with farmers so they could have a market where they could name their own prices and sell directly and make more money that way,” Graziosi said. One particularly heartening presentation for Dr. Sapra involved an app that helps refugees find resources in their area. “A graduate student group at UMass Boston called ‘Refugees Welcomed’ are using their tech skills to create a migrant service map that helps immigrants and migrants in the area to see what kinds of services are available to them like health, legal, employment, education, and housing services. It was really inspiring to see young people use the skill-set and knowledge that they have and channel that into issues that they care about,” Sapra said. At the same time, there were some parts of the conference that could be improved. Wei noted that more time could have been dedicated to interaction and networking among attendees. Others, including first-year Dylan Blowe, felt that a more intersectional approach, one which took into consideration race and class, was needed in discussing and tackling the major issues of the conference. Overall, the group left the conference feeling empowered. “Nation-states are not leading the future. Our cities and institutions are leading the future. Individuals are large and the groups we form are steering our collective course. Leaders from universities in Russia, China, Armenia, all continents committed to continuing to work together and deepening their relationships with one another. I’m glad to have been a part of this opportunity,” said Carpenter. From left to right: Brenna Carpenter, Caitlyn Councilman, Ree Ree Wei, Diya Abdo, Dylan Blowe, and Casey Graziosi.